1. Use products made from recycled paper. Recycled paper looks beautiful and keeps the earth healthy. The styles, textures, and colors available are endless and some are even being made from 100% post-consumer waste. If you really want to save the planet, try making your own paper! All it takes is a blender, torn up bits of paper, a little water and a screen. You can even add flowers or confetti to your paper for a sprinkling of fun. (For further instructions, look up "how to make paper" online or find a book at your local library.) Hand-made paper is stunning, and will show your guests you took the time to care--about them and the planet. 2. 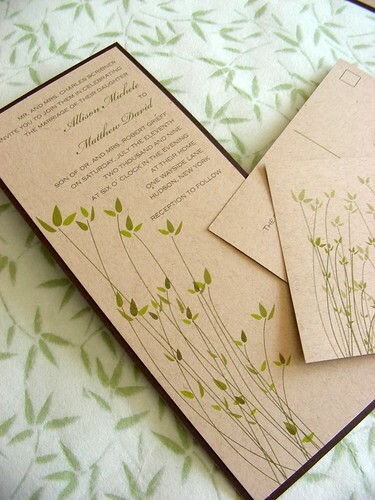 Check out plantable invitations. An invitation and a favor in one, these are gifts that keep on giving back! Your guests plant the invitation in their yards, and the result is a garden of beautiful wildflowers. Not only do you cut down on waste, the flowers your guests will enjoy put oxygen back into the air, making plantable invitations our favorite two-fer! 3. Skip the extras. Do you really need that inner envelope? What about all those enclosures? Leave out the map, weekend events, and accommodations cards, and just include a small card with your wedding web site, where guests can get all the information they need online. Each small step you take helps. 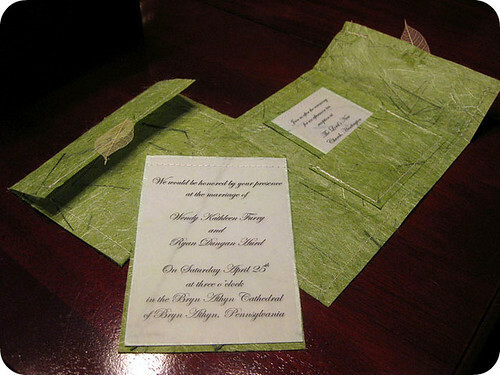 As you design your perfect DIY wedding invitation, think, "Can I use a recycled product? Can I repurpose something? Can I do without this part?" Every time you reduce, reuse, or recycle, you help make this earth remarkable.